An artillery shell containing a small amount of the nerve gas sarin has exploded in Iraq. Brig Gen Mark Kimmitt said the blast had caused a small release of the substance and two people had been treated for exposure to the agent. The substance was found in a shell inside a bag discovered by a US convoy a few days ago, he said. It appears to be the first evidence of nerve gas existing in Iraq since the start of the US-led war last year. The 155mm artillery round had been set up as a roadside bomb and it exploded before the US military were able to defuse it. Gen Kimmitt said the dispersal of the nerve agent from a device such as the homemade bomb was "limited". "The former regime had declared all such rounds destroyed before the 1991 Gulf War," he said. However, a senior coalition source has told the BBC the round does not signal the discovery of weapons of mass destruction or the escalation of insurgent activity. He said the round dated back to the Iran-Iraq war and coalition officials were not sure whether the fighters even knew what it contained. Sarin is a toxic nerve gas 20 times as deadly as cyanide. A drop the size of a pin-head can kill a person by effectively crippling their nervous system. The gas is one of a group of nerve agents invented by German scientists in the 1930s as part of Adolf Hitler's preparations for World War II. Although the Germans never released sarin in battle, it was used to lethal effect by Iraq during the 1980s both in the war against Iran and against the Kurds. 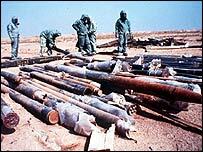 After the Gulf War, United Nations inspectors found large quantities of sarin in production at an Iraqi chemical weapons plant. The Japanese doomsday cult, Aum Shinrikyo, also used the nerve agent in a Tokyo subway in 1995, in which 12 people died. "A highly toxic gas that can result in an agonising, choking death"